There is something I like about this picture. +1 for this when I can rate posts again. Why did I use them all up? River and the Doctor are the most awesome couple ever to set foot on the TARDIS. I bet she is actually his wife. I bet they wont do lesbianism, they barely did the gay thing with Captain jack and well, he's just 'jack'. The BBC can't really do that before watershed, imagine explaining to a 5 year old why Amy is kissing a girl while shes married to rory? Seems too far for the BBC to go. I would love it though. They're just so darn cute! Isn't anyone still completely obsessed with Doctor Who in the good old days (season one and two, and perhaps the end of season four)? Though I loved Donna and Martha had her moments, I feel like Doctor Who has really changed (obviously). 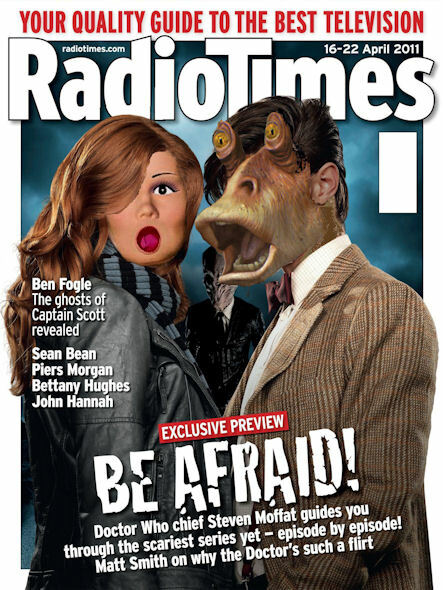 Steven Moffat's out of control in his quest to leave his mark on the show! He says he's not too keen on the character and is unlikely to re-introduce her to the Eleventh Doctor. Please let me know your thoughts on them! Cute moments, cool videos...your opinion on the couple (so long as it's the right opinion ). I don't want to see Rose back. I liked Rose but it was starting to get annoying where she just had to keep reappearing throughout the Tennant era. I really liked Martha and I know not many people did, but I think she was my favourite companion! Yeah, just ain't the same thesedays. I miss the "team". Rose, Jack, Mickey etc. Feel nothing for Amy, Rory or River Song. Meh. I would turn for David Tennant...What? Amy, Rory, River > Rose, Jack, Mickey. I really liked rose/ 10 but the way that it was all wrapped up and she has the 10 clone and shes even in a different universe I don't think it would be right to bring her back. You are so wrong that I feel sorry for you. And your wrongness makes me happy. Curse you guys! I tried to stay off this site but Doctor Who drove me back on :/ Long time lurker on this thread but I would like to add my two cents having read the majority of it (sad I know). Firstly a couple of things I don't seem to get (even having watched it 3 times). Why does it take the doctor 5 days to rescue Amy? We know she's been in that tardis-esque thing for five days but where has he been? Surely he can't be certain they'd wait until the moon landing to "bring silence"? I think River looked mighty shifty when they were discussing the silents. Not sure what minute this was on, but when they are doing the hand injections thing she looks down when the doctor says he can't remember them either to Canton. Possibly implying she's in/was in cahoots with them? River also says "Well I say she's human" when inspecting the space suit. Being an archeologist you'd think she'd know. So maybe the kid ain't a time lord? I'm of the opinion that Amy's off hand joke "time head" implies that whilst her sprog won't be a time lady; it may suffer some of the attributes time lords possess. Therefore if the girl is Amy's and she turns out to be River (mighty big assumptions I know, but I like where this is leading), then her changing appearance provides a loop hole for Steven Moffet to keep River in (and thus show her adventures with our doc) and provide an exit for Alex Kingston (who's surely too big an actress to want to play all the adventures her and the doctor must do to have their relationship). Also it would mean our companion for next season will be River, therefore we don't have to start from scratch like the last 3 or 4 companions. She was amazing in Pompeii, and the Library episode was good as well, the way she was nice to the girl (who's name I've forgotten, but she was the first to die. ) when the others weren't, and the way she treated the Ood, she was an awesome character. No denying it. However I was never a fan of Rose. She was a bit chavvy and fair enough I guess, but it was completely unrealistic that the Doctor should love someone like her. I quite liked Donna because while she was a massive chav she was kinda brusque and so forth. Martha was so bad in my opinion, as was David Tennant as the Doctor. I love Amy, mainly because I love gingers, but she's sweet and yet not a complete pushover. And of course Steven Moffat is the biggest legend in the world and his take on it all second to none. The only thing I don't like about the new series is all this River Song rubbish - I really don't care and she has zero chemistry with the Doctor. I don't think the silents really are defeated there was one in 2011 remember? and he said humans would be fighting them for generations. I'm sure they will come back. Martha was a great companion. I mean, she travelled all around the world for a year on her own to save the Doctor, Rose never did that. I got that. I just meant that this defeat may have not been a defeat. And that the silents have been planning something. I mean even with the girl running off. Surely she couldn't have done that without the silent's knowledge?